Published on 04. 04. 2016 in comics and cartooning and commentary and criticism. Closed Tags: Charlie Hebdo. 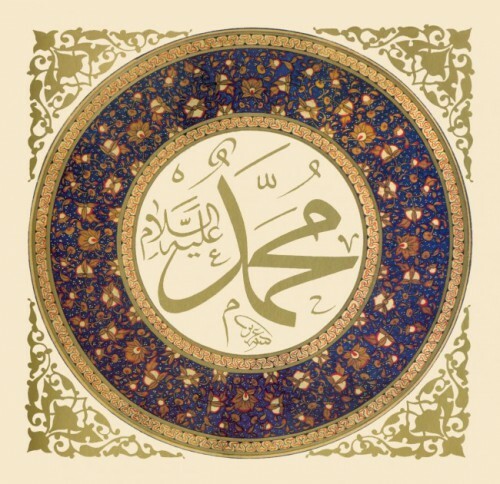 The thing is, there are points to be made here: surveys made among Western Muslims indicate how widespread casual anti-semitism and homophobia are, how paternalistic attitudes toward women can be, and demonstrate surprisingly little discomfort with such passages of scripture as those that condemn to death apostates and women guilty of adultery. Obviously, surveys are not the whole truth, and I assume that most Western Muslims actually have a much more nuanced approach to life than statistics may lead one to think, but it does seem that there is remarkably little open debate about such issues among Muslims. This despite the fact that some of these attitudes and doctrine are anathema to a society built on the rights of the individual and constitute part of the foundations of jihadist terrorism. Similarly, left-wing and multiculturalist efforts to downplay them or place the blame for jihadist terrorism quasi-exclusively with Western foreign and integration policy (important as those factors are) are not doing anybody any favours either, least of all Muslim dissidents. Unfortunately, very little of this comes across in Riss’ sloppy and sensationalist op-ed. It’s as if he is talking in the same blunt register as he does in his political cartoons, but without the humour. His defense of secularism–in itself essential to our societal model–is shrill and paranoiac. In the English translation of the piece, he (or perhaps his translator) even likens the purported conspiracy of silence described to terrorism. Strangely, and perhaps somewhat reassuringly, this passage is absent from the French original. 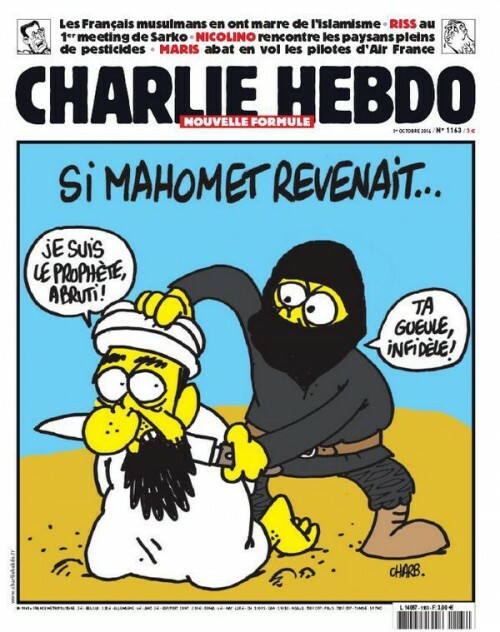 The absurd claim that a Muslim baker who does not serve pork is somehow infringing our rights to eat what we like and thereby is complicit in terrorism, however, is present in both and is an execrable example that threatens to remove all sense from his argument–confirming the fundamentally unjust caricature of Charlie as a bigoted, hateful publication. Of course, the editorial was written by someone who has been on the receiving end of jihadist Kalashnikovs. I expect this makes him see certain things more clearly than I, but it is also well known that anger does not make for great politics. Published on 17. 01. 2016 in comics and cartooning, commentary and criticism, current affairs and pictorial arts. Closed Tags: Andrew Butterfield, Charlie Hebdo, Dominique Sopo, Donatello, Jack Kirby, Leonardo, Riss, SOS Racisme, Waldemar Januszczak. Published on 12. 01. 2016 in comics and cartooning, commentary and criticism, current affairs and journal. Closed Tags: Adam Gopnik, Al-Jazeera, Charb, Charlie Hebdo, Emmanuel Todd, Guantánamo Bay, Jeremy Harding, Kenan Malik, Nummer9, Paris, Sami al-Hajj, Thomas Hegghammer, Thomas Thorhauge. Published on 07. 01. 2016 in comics and cartooning, commentary and criticism and current affairs. 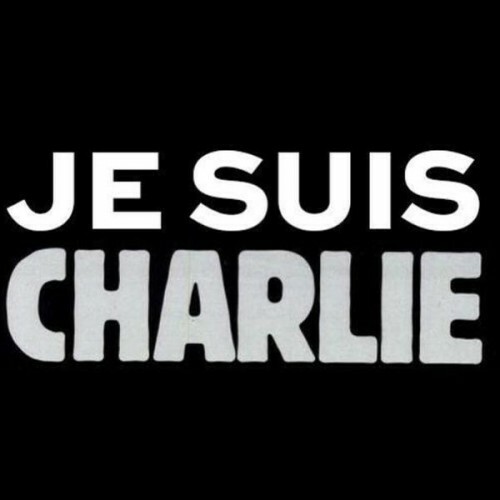 Closed Tags: Charlie Hebdo, freedom of expression, freedom of speech, human rights, Hyper Cacher, Paris. Today, and on Saturday, it happened a year ago. In some ways it wasn’t all that new, nor unexpected — jihadist terrorist attacks have happened all over Europe with increasing frequency for the last 10-15 years, and several lower key attempts had been made to silence Charlie Hebdo. In fact, it remains scandalous that they weren’t protected better — the attack on their offices could have been prevented. Published on 30. 07. 2015 in comics and cartooning, commentary and criticism, current affairs and hype & linkage. 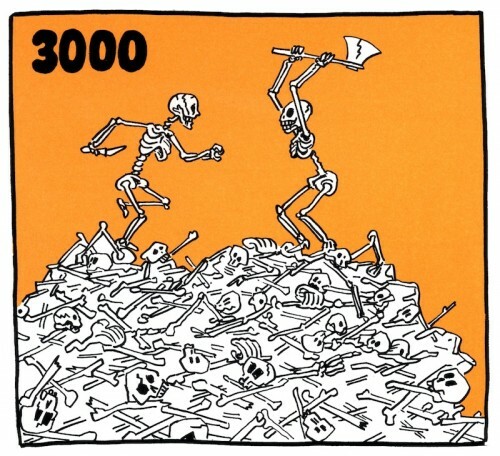 Closed Tags: Charlie Hebdo, Rotland Inquiry, Rotland Press, Ryan Standfest, The Comics Journal. 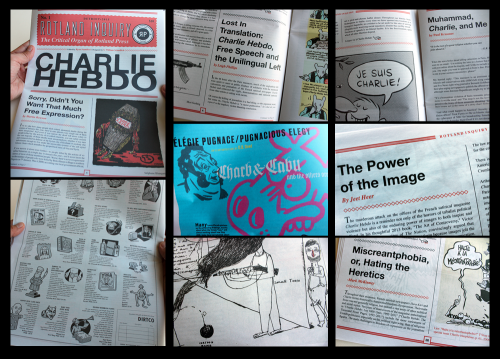 Ryan Standfest, publisher at the small-press (dark) humor operation Rotland Press, recently put out the first issue of the Rotland Inquiry, which focuses on Charlie Hebdo, the Paris murders and their aftermath. Standfest has assembled an impressive range of cartoonists, critics and historians who present a variety of viewpoints and thoughts and images on the subject. The roll call sounds: Stéphane Blanquet, Hugleikur Dagsson, D.B. Dowd, Mort Gerberg, Jeet Heer, Danny Hellman, David Hughes, Paul Krassner, Mark McKinney, Tony Millionaire, Leigh Phillips, Martin Rowson, Johnny Sampson, Mahendra Singh, Art Spiegelman, and um, me. I’m in there with an edited and slightly updated version of one of the pieces I wrote for The Comics Journal back in January. I’m proud to be in the publication and encourage you to seek it out. It’s well worth it, whatever you think of my contribution. More on the publication and Rotland Press from contributor D. B. Dowd here and here. Published on 13. 02. 2015 in comics and cartooning, commentary and criticism, current affairs and hype & linkage. 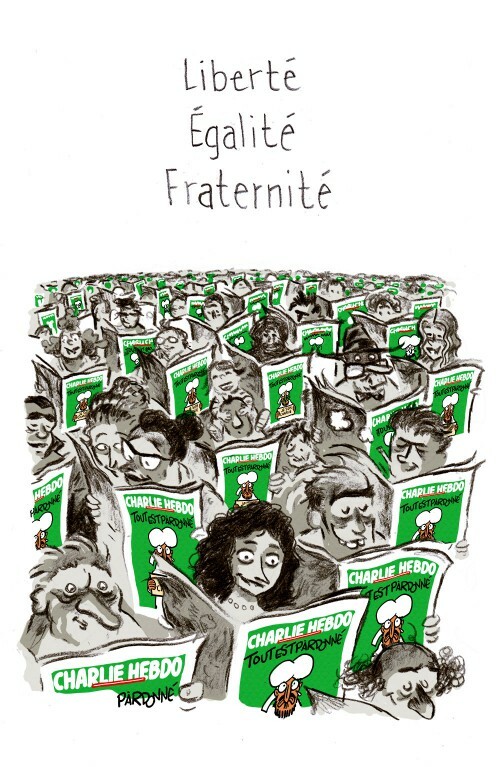 Closed Tags: Angoulême, Charlie Hebdo, FIBD 2015, The Comics Journal. As mentioned a few weeks back, I was once again covering the Angoulême comics festival for The Comics Journal this year. It as a strange, beautiful and slightly oppressive experience being there, three weeks after the Paris killings. This dominates my reports, I’m afraid, but tune in also for views on artists as diverse as Bill Watterson, Alex Barbier, and Taniguchi Jiro, and for thoughts on French comics right now, the state of the Angoulême festival, and the award winners. Onsite reportage parts one and two plus the usual more in-depth aftermath analysis. Published on 03. 02. 2015 in comics and cartooning, current affairs and hype & linkage. Closed Tags: Charlie Hebdo, The Comics Journal. It’s been up for a few days now, but I just wanted to note that part two of my examination of Charlie Hebdo and the significance of the murders in Paris is online at The Comics Journal. Part one is here. Published on 24. 01. 2015 in comics and cartooning, commentary and criticism, current affairs and hype & linkage. Closed Tags: Charlie Hebdo, The Comics Journal. 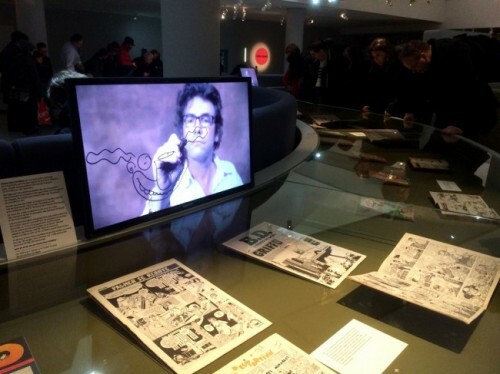 I recently published a review of the latest, 7 million print run-issue of Charlie Hebdo over at The Comics Journal. I have a second article, which delves further into the contentious and complicated issues surrounding the massacre, the cartoons and journalism of the magazine, and a bit of everything else, so stay tuned. Published on 15. 01. 2015 in comics and cartooning, commentary and criticism and current affairs. Closed Tags: Charlie Hebdo. 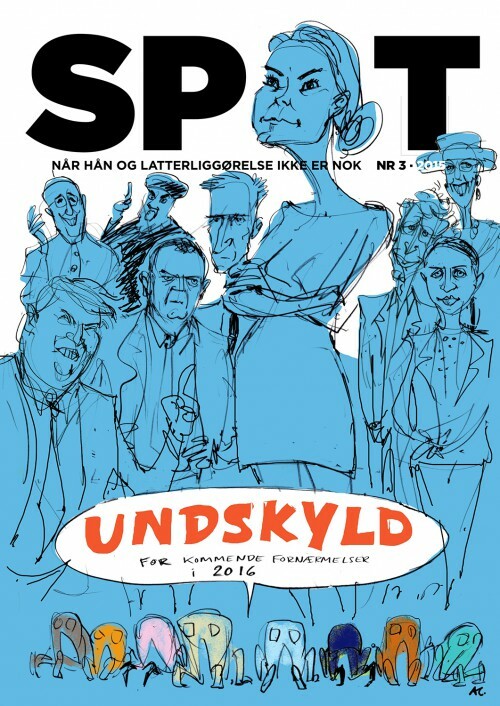 I dagens udgave af Information kan man læse min anmeldelse af ugens med spænding ventede nummer af Charlie Hebdo med den bemærkelsesværdige forside ovenfor. Jeg skrev teksten til en meget stram deadline, så bær over med den lidt stakåndede præsentation, den manglende reflektion og en lidt brutal redigering. Jeg håber at skrive noget mere dybdegående snart. Published on 07. 01. 2015 in comics and cartooning, commentary and criticism and current affairs. Closed Tags: Charlie Hebdo. 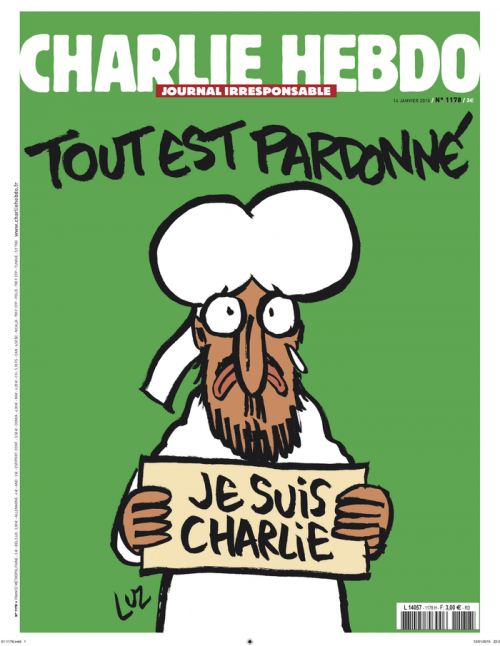 Charb (RIP) channels Dostoyevsky's "Grand Inquisitor"
Today witnessed a mockery of the values of human dignity and community, fundamental concepts in all the major religions, not least Islam. It has already been repeated much today, but this really does feel like an attack on us all, and not just in the West, but much more broadly. My thoughts are with the families and loved ones of the victims, while my hopes are with our societies to handle this outrage in the right way. There must be a robust response to the perpetrators and, more broadly, the mindset that motivated them, but ultimately the solution is more democracy and more freedom of expression for everyone, not less. Insha’Allah.